We looked at some Filet Lace jewelry here, so now let's look at some Needle-Tatted jewelry! 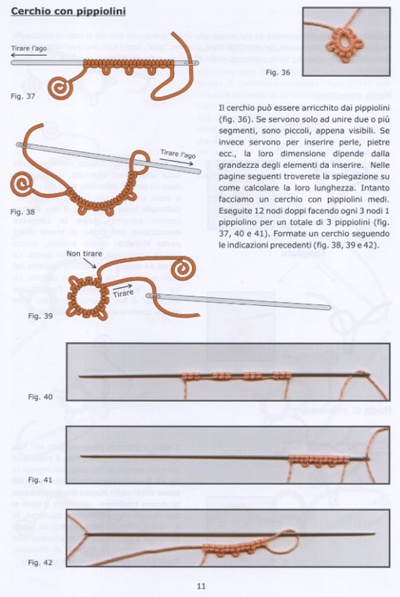 Needle tatting is simpler than shuttle tattling (so it says in the introduction of Creare Gioielli [Create Jewelry]) and is also better suited to individual creativity. "Creating necklaces, bracelets and earrings has amused us for years. Making original and unique jewelry which goes perfectly with our own style and clothing gives us great satisfaction." Alicja invites the reader to try something new, to add semi-precious stones, crystals, beads and other decorative elements to their Needle-Tatted jewelry choosing from the vast selection of threads which are available on the market today. 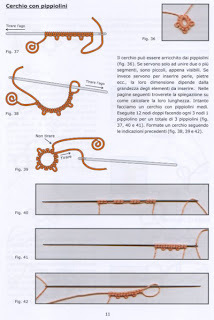 The book has 10 projects which then branch off and show you how to create many more once you have understood the basics of attaching things like beads, closure hardware, hooks for earrings and the like. Each project teaches a different method and at the end of the book there are lots of colour photos of different ideas for other projects. "At the end of this book, you will have acquired the skill to create your own jewelry. Ideas for getting started can be found in any Tatting publication, for example you can take an element from a doily and make it into a beautiful necklace, bracelet or pair of earrings." 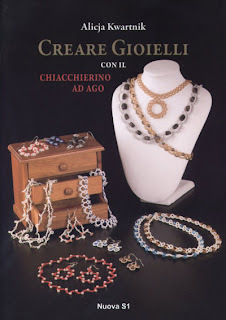 Suitable for both beginners and experts alike, Creare Gioielli is 64 pages of inspiration to stimulate your creativity! I don't do Needle Tatting, but I really want to make some of the earrings in this book! It's nice to see your post on tatting, and I enjoyed seeing all the eye candy. Thank you.